A wave of civil unrest ravaged the country after a rigged election put President Pablo Escobeer back into power. The government labeled the political opposition as ‘the enemy of the people’ and declared a national emergency to weaken any resistance. The ruthless president killed thousands by abusing his executive powers to use chemical weapons against peaceful protesters and rebels alike. Your team was sent into the country to help its people to overthrow the corrupt regime. They discovered the location of a factory compound that was rumored to manufacture a deadly gas. After infiltrating the compound, it became very clear that something was off. Help your team of hired guns to stop the chemical attacks and guide them back to safety. 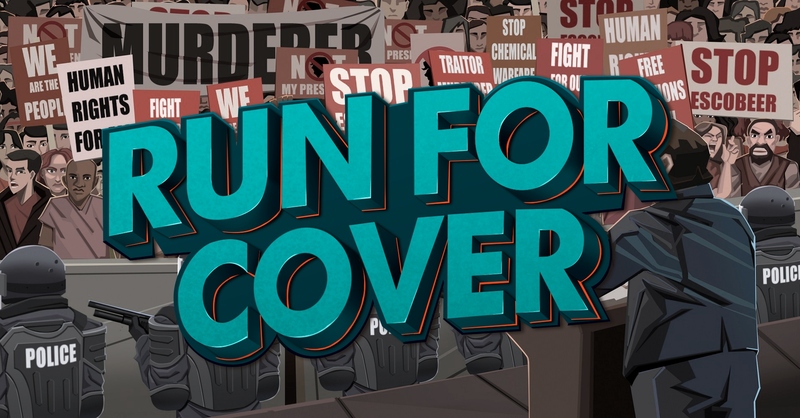 Run For Cover is a turn-based strategy game where you control a team of soldiers trying to escape enemy territory after a mission gone wrong. The team is chased by the enemy and forced to keep moving. 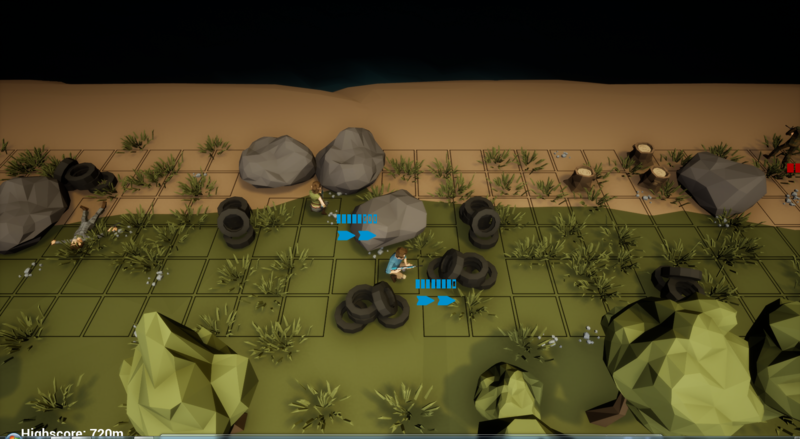 The world is procedurally generated and creates unique challenges every time you start a new game. The map is filled with different quest, enemies and distinctive areas. Your soldiers gain experience with every step they take and unlock powerful abilities. Everyone who buys the game can request a key for Steam from me as soon as a version is available! I made a video on the tanks. Your last comment was really helpful even though I didn't get up to the forest. One day I will! It would be cool if there was a multiplayer co-op to play with your friends. Your comment on YouTube somehow got flagged as inappropriate by their own inappropriate comment system. I apologize for that. I have turned it off due to how bad it is. I made another video on this, but I had a couple questions for the update. It would be great if you could answer them. I might end up making a series on this game. Thanks for the help and answer! Do I have to keep buying the game for every update or do I just pay one time? Just curious about this. You can additionally request a free Steam key from me as soon as the Steam version is available! Nice video! You were wondering about the tanks! Currently, they have a 50% chance of appearing at the entrance of the forest! Not sure about the next update though - it will probably feature hostages, molotov cocktails or smoke grenades. I made a video on this game. It's a pretty good strategy game. I love this game even though I'm bad at these types of games. I might make another video on this. I found your game by looking through itch.io with my friend, seeing what game would be interesting to record. I found this game interesting, and decided to record and play it. I will definitely stick around for the next update. Looking forward to it! Long Version/Längere Version mit Erklärung. Another awesome video! Thank you! It was really fun to watch you play my game! i make a german test video of the game, have a look guys :) Deutsches Angezockt, schaut mal rein leute. However, I ran into a terrain building bug only 720 meters into the game, where I reached a dead end. Screenshot is attached. This is actually pretty surprising! I have never encountered that issue! I'll try to find out what happened and fix this bug in an upcoming update. Thanks for sharing!!! On my notebook the game crashed at exactly the same spot. Got a message box that told me there was a problem and the window would close. Just an OK button, no Debug, no Ignore. I must say that before that I had the same result in two other runs at earlier positions. Actually I never "died" because of enemy action but always because of the game crashing after some time. Couldn't finish the first level because of that. The notebook is a current MSI gamer laptop with an i7 and Nv 1080 graphics running Win7 Pro SP1, not overclocked and usually totally stable. But it's a great effort and has potential. I like it very much. Also great idea to hook people (not only) in Germany via your friends YouTube :-). Guessing from this thread more Germans use her as a mirror than Americans for finding out about us Krauts ;-). Thank you very much for your kind words. I really appreciate your feedback. The range of the weapon is indicated by a red enemy highlight in the movement preview. It tells you what you can shoot at from that hovered position. I will update the tool tips to detail include more info about range and critical hit chances, since a lot of people were wondering about those hidden values. Played the debug version for an hour ... no crash. That usually happens when the debug gets compiled with a lower (speed) optimization level. I think we have a misunderstanding about the red squares on mouse-over ... I "want" to see those relative to the intended move position before I move. The idea is to be able to judge where to move to stay outside enemy range but inside own weapon range. The Battalion series of games on Kongregate is a good example, especially Battalion Ghosts. Really love the colors you choose ! But maybe that auto-centering can become optional ? Whenever I have positioned the view in such a way that I see the entire scene I get refocused on the 2nd figure ... And maybe you can allow movement of one figure through its partner ? That Sokoban style of thinking in a battle environment may not be 100% natural. Those guys would be jumping and squeezing to bypass each other, I think. But please forgive me the nagging. Just want to tell my POV in order to help. Maybe others have an entirely different opinion. I have fun trying to get past the opponents without the use of grenades and medipacks. Maxed out on the levels though :-) ... and still wonder how to get to the Easter Egg when the gate to that pool blows up (if that is a pool and if there is something hidden there :-) ) ... I'll probably try another run later today and see if it crashes but with the previous version the crashes came much earlier. I am glad to hear that you checked out the version and you did not experience any crashes. I will update the official build with the fully optimization version and hope that some of my changes fixed the issue for good. I really appreciate you taking the time to help me out with this! Thank you also for your input regarding the game design. I will look into Battalion Ghosts to find out what I can do to improve my game. The passing of friendly units might be totally something I could check out in a later version. The exploding boat at the beach just marks the end of the prototype, it's not an easter egg or anything . That is what you are talking about right? I think I want to add at least one more level and maybe 2 or 3 more abilities to offer more variety between the units. Really appreciate your help! So I checked it out, I really like the concept. I think if you want to continue with this path of long "endless" hallway perhaps consider upgrades or unlockables on the way. This will give the players a sense of progression. As well as add coins or some sort of shop currency so players can upgrade stats as they die and replay. That's assuming that I am reading this right and you are making a turn based rogue-lite. Thank you for taking the time to play my game! I really appreciate that! The prototype will feature an inventory system that allows you to pickup the gear of your enemies and improve / craft your load-out. It is supposed to be something like ... "Fight with what you find"
Game looks great! sorry I couldn't donate anything at this time. I gotta make sure to come back and do that sometime! Came from reddit and downloaded it. Tactical/Survival gameplay is pretty good and looks like it has a lot of potential. Will be looking forward for updates! Looks very promising! Will you be needing any music for this game? sure! do you have some references? I would love to add more music when the project gains some traction! Great, well I would be interested in collaborating when the time comes.